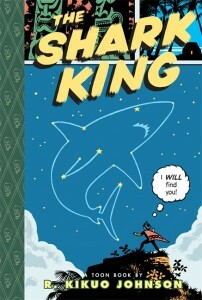 After being enthralled with Night Fisher I was anxious to read R. Kikuo Johnson’s next comic endeavour The Shark King. From the islands of Hawaii comes the electrifying tale of Nanaue, who has to balance his yearning for Dad’s guidance with his desire for Mom’s nurture. Award-winning cartoonist R. Kikuo Johnson transports young readers to the lush tropical shores of his native Hawaii. Fluent or not, young readers will be thrilled when they experience the transformative powers of a stirring literary work. Meet Nanaue, a boy craving to be who he truly is. Let me start off with a big disclaimer: The Shark King is in no way like Night Fisher, so don’t buy this thinking it’s the same thing. This is an all-ages graphic adaptation of a Hawaiian myth about the Shark King, who takes human form to marry a young girl and together they have a son. The boy grows older and grows a shark mouth on his back that he has to keep covered. His insatiable appetite leads to conflict with the local village and he gets found out but goes to live with his father in the ocean. It’s an odd myth to be sure but I read it to my 5 and 3 year old children and they saw nothing wrong with a boy having a shark mouth on his back and going to live in the ocean. Johnson proves again he is a master of visual storytelling. Employing a much simpler art style with strong use of solid colours and effective shadows/blacks. Clean lines with solid fills; it gives an all-ages/children’s book feel without losing any of its visual impact. The Shark King is an interesting tale. There’s no moral to the tale: Nanaue is shunned by the villagers and leaves his mother, who has lived in isolation since her marriage, to live with his father. No acceptance or particularly happy ending, but an important lesson none the less: be happy with who you are and don’t be defined by others. A slim volume with 35 pages of content, it hits the mark for a targeted audience.